ILMILIEKKI is a superb 4 piece band from Finland that's winning the hearts of contemporary and mainstream jazz lovers in Scandinavia and beyond: trumpet, piano, bass and drums. Ilmiliekki’s debut album 'March Of The Alpha Males' on TUM Records was a nominee for a Jazz Emma (the Finnish Grammy) for the best jazz album of the year 2003. 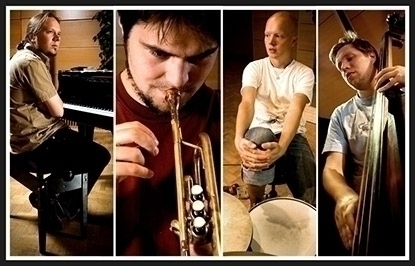 In 2004 the band was nominated Young Artist of the Year by the Finland Festivals organisation, while Verneri Pohjola was chosen as the Pori Jazz Festival Young Artist of the same year. Also in 2004, Ilmiliekki received the highly respected Teosto Prize (the Finnish Composers Copyright Society’s prize), and following Ilmiliekki's new release 'Take it with Me' , Verneri Pohjola was voted the 'Jazz musician of the year 2009' Emma award in Finland. Considering all this the Ilmiliekki Quartet represents some of the best young talent in Finnish jazz. The band's leader, trumpeter Verneri Pohjola (1977), features frequently in his own projects (award winning 'Aurora' project 2009). The real power of Ilmiliekki, however, lies in their ensemble playing and interaction. All four musicians are major players on their respective instruments and they all share the vision, attitude, courage and self-confidence necessary in order to make creative, ambitious and impressive music.